HA GIANG (VNS) — Some 250,000 people living in the Dong Van Rocky Plateau region in Ha Giang Province have suffered for many years from a lack of water during the dry season. This plateau stretches across the four districts of Dong Van, Meo Vac, Yen Minh and Quan Ba. 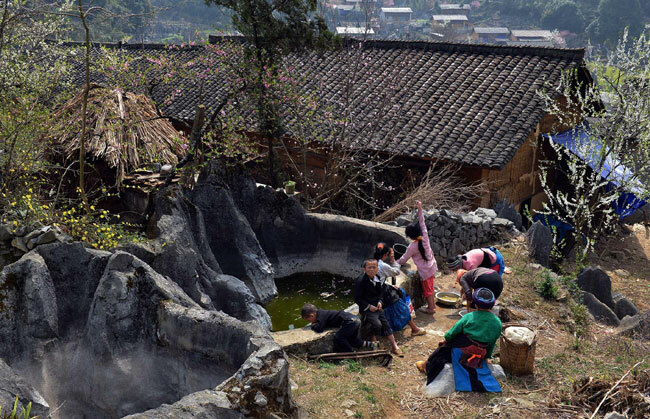 Located in the northern part of Viet Nam at an altitude of 1,000 to 1,600 metres above sea level, Ha Giang is a land of harsh terrain that is frequently affected by drought. For years, it has faced shortages of water during the dry season. The dry season in the northern provinces of the country lasts from November to April. Tho Mi Dinh, a Mong man from Meo Vac District's Pa Vi, said he still walked several kilometres from his house every day to fetch water from a common tank. He added that he could only carry some 20 litres of water at a time. Dinh further noted that the water he carried back home sufficed only for cooking, so his family usually went months without bathing. Moreover, Ly Mi Bo of Map Pi Lieng Commune said he had to venture into the local forest every day, taking water for daily use. Further, Vice Chairman of the People's Committee of Meo Vac District Sung Mi The revealed that many households had to buy water from other locations. To meet the demand for water, trucks carried water from the province's Nho Que River to sell it to the public, he said. "A cubic metre of water usually costs around VND70,000 to VND100,000 (US$3 to US$4.5)," he noted. According to the provincial authority, 30 small reservoirs have been built since 2007, after their construction received approval from Prime Minister Nguyen Tan Dung. However, the reservoirs are small and the amount of water they store is not steady. This is because the amount of water the reservoirs stores depends upon the volume of rainfall during the monsoon season. Therefore, reservoirs only meet the demand for water for use by a small portion of residents. In late 2012, however, experts from the Ministry of Natural Resources and Environment discovered groundwater in the rocky plateau. Yet, due to lack of funds to build infrastructure to exploit the groundwater, it has yet to help the local population, according to Deputy Director of the provincial Science and Technology Department, Pham Minh Giang. Giang also noted that there was a project to pump water from local streams for people living in areas with limestone reserves, under a co-operative program between the Viet Nam Institute of Geosciences and Mineral Resources and a group of German experts. The project was expected to being implemented since mid-2015, he noted. Meanwhile, Deputy Head of the Ministry of Science and Technology's International Co-operation Department Le Thanh Binh said that the project should be carefully implemented to ensure maximum effectiveness.